While business services are normally delivered to consumers via the Internet in the form of websites, GlobalSpotz has created a new delivery platform for service industries based on contextual networks. SAN FRANCISCO - July 23, 2017 - PRLog -- In today's mobile world, everything is done through social networking. While Internet search engines, like Google and Bing, provide a means to find the services you're looking for, they aren't connected to the socially networked world we live in. And, once you submit your search, you have to parse through the search results in order to find what satisfies the intentions of your search. GlobalSpotz has created a solution to this conundrum in the form of contextual networking called "fabric networks". Aptly named because of their contextual relationship to a specific service industry, creating a "fabric" of multi-threaded networks based on the context of the service industry and connected to social networking platforms like Facebook and Twitter. The first implementation of this new networking technology is for the Food & Beverage service industry where consumers can now find anything they're looking for in the way of food and drink without having to search for it. This new contextual network is accessed through a "network hub application" called FoodieSpotz, providing consumers with access to 45 unique industry specific "fabric networks" based on the contextual affinities for cuisines and food types. Food & Beverage businesses that are signed up on the GlobalSpotz PROMOS™ Customer Network platform are listed on these "fabric networks" and have their own white labeled mobile e-commerce network portal app that provides consumers with their menus and promotional offers and the ability to order and earn rewards. Additionally, these businesses can link users to their white-labeled mobile e-commerce network portal app by simply putting an ICON or link on their current websites. Food & Beverage businesses that are not on the GlobalSpotz PROMOS™ Customer Network platform, but are found on the Foursquare network, are also listed on these new contextual "fabric networks". 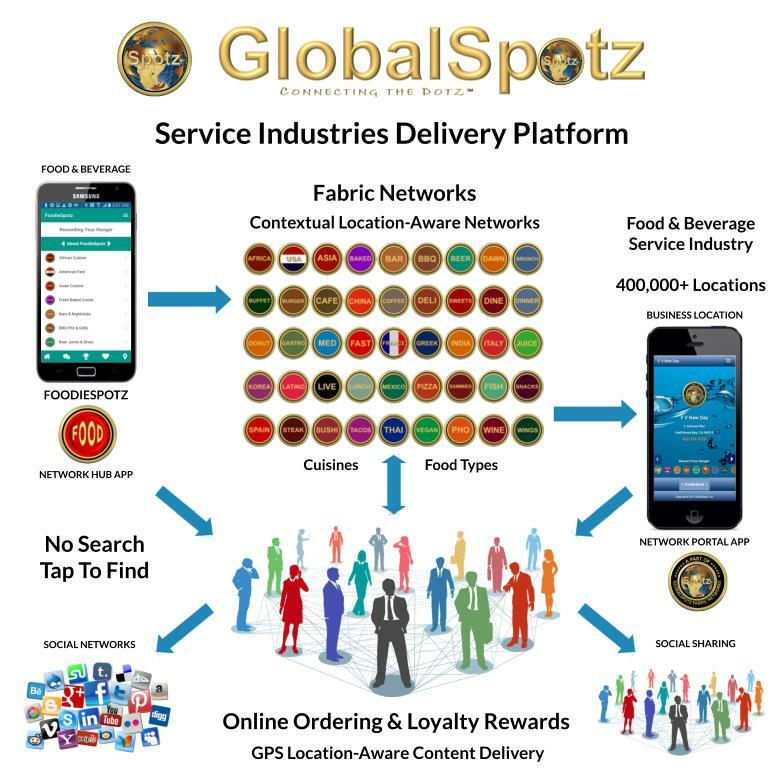 And, the GlobalSpotz "fabric networking" platform dynamically generates a mobile e-commerce network portal app for any Foursquare listed location on-demand by the consumer, enabling the consumer with the ability to order directly from that Foursquare listed business and earn rewards as well. Currently, there are more than 400,000 restaurants listed on the various Food & Beverage "fabric networks" across 45 different cuisine and food types. More than adequate for finding an eating establishment to satisfy your hunger or thirst needs and all with just a couple of taps on your phone, without having to "search" for it. While the Food & Beverage service industry is the first application for this new networking technology, the GlobalSpotz contextual networking platform has been architected to work seamlessly across all current service industries identified by the US Department of Labor. Simply go to - https://foodiespotz.com - join the network and find anything you want in Food & Beverage with just a tap or two on your phone!